Charlotte-Douglas International Airport is one of the nation's busiest. If you find yourself with some extra time and an appetite for food or retail therapy, there are plenty of restaurants and shops to choose from. Whether you're looking to sit down and try some local flavor or simply grab a quick bite, you've got plenty of options. And if you have some time to kill between connections and feel the urge to shop, you will find a variety of stores to meet your needs, from those selling sunglasses to cell phone chargers to gifts to take home for the family. The Charlotte airport is sort of a "hub and spoke" design, meaning that all terminals branch out off of the main Atrium. Here is a guide to eating and shopping organized by the terminal. If you see something you like in another concourse, don't worry—traveling between concourses is easy, and never too terribly time-consuming. The center of the airport is not only where departures and ticketing are located, but also where you will find the largest number of restaurants and shops. If you only have time for grab-and-go, head to Coca-Cola 600 Cafe or 1897 Market. Fast food options are Burger King, Chick-Fil-A, Papa John's, and Quizno's Sub. For a sweet snack or pick-me-up, there's Aunt Annie's pretzels, Cinnabon, Jamba Juice, Starbucks, and Red Mango and TCBY frozen yogurts. For one step above typical fast food, you'll find Brookwood Farms BBQ (traditional Carolina Pit BBQ) and two choices of Mexican—Salsarita's Fresh Cantina and Tequileria. If you have time on your hands and are interested in more of a dining experience, the Atrium has some good offerings: Beaudevin (a wine bar with small plates, sandwiches, and salads), First in Flight Bar with Hissho Sushi, and 1897 Market, an "urban gourmet oasis" featuring a raw bar, carving station and grill, and wood pizza oven. When it comes to shopping, you will find everything from clothing to electronics to jewelry. To refresh your wardrobe, head to Brooks Brothers, Johnston & Murphy, or PGA Tour Shops. If you left your headphones at home, or want to browse the latest devices and gadgets, you have your choice of Best Buy Express, Brookstone, EA Sports, Inmotion Entertainment, and Sound Balance. For a selection of baubles and accessories, check out Brighton, Erwin Pearl, Pandora, and Taxco Sterling Co. The Body Shop is also in the Atrium, featuring a wide selection of lotions and potions, and if it's sunglasses you're after, Shades of Time is where you need to go. Just want to grab a book or magazine for the flight along with some chewing gum? Heritage Booksellers, CNBC Smartshop, On the Square Gift and News, and Queen City Gifts and News are your best bets. There is also a duty-free shop as well as Rocky Mountain Chocolate Factory. This terminal is home to Air Canada, Delta, Frontier, JetBlue, Southwest, United, and Via airlines. If you are looking for a quick bite, your choices are Wendy's and Cinnabon. For something more substantial, head to Phillip's Bistro for filling breakfast choices (until 2:00 p.m.) and a variety of grab-and-go, or Uptown Bar & Lounge, the only full-service bar in this terminal. Food selections range from chicken wings to tuna salad. The only store in this terminal is Charlotte's Landing News & Gifts. If you are flying American Airlines, this may be your terminal (although the remaining terminals all have American Airline gates). This concourse features nine locations to get food, from something grab-and-go at the Farmers Market to a quick bite at the Great American Bagel, Bojangles’ (fried chicken and biscuits), and ASAP California Pizza Kitchen, to waiter service at a Taste of Carolina and the Stock Car Cafe. For a refreshment or sweet treat, there's a Starbucks and Pino Gelato. Need a cocktail? Head to Red Star Lounge. Concourse B is a good place to shop if you're just looking for a souvenir, snack for the plane, or something to read. Charlotte's Got a Lot has local gifts while New South Travelmart is a quintessential newsstand. If you're a fan of CNBC, check out their shop. Another American Airlines terminal, this concourse has a Starbucks and TCBY, as well as Sbarro, in addition to Wolfgang Puck Gourmet Express and Fresh Attractions Deli for grab-and-go. If you have time to sit down to eat, there's Phillip's Famous Seafood and Bad Daddy’s Burger Bar. Newsstands are the only shops here: News 2 You and CNBC News. Besides American Airlines, Lufthansa flies out of this terminal. If you find yourself with some time, sit down at the Original Rum Bar and Grill for tropical cocktails and fare; if beer is more your thing, try a local brew at Carolina Beer Co. along with some pub grub. Need something a bit quicker? 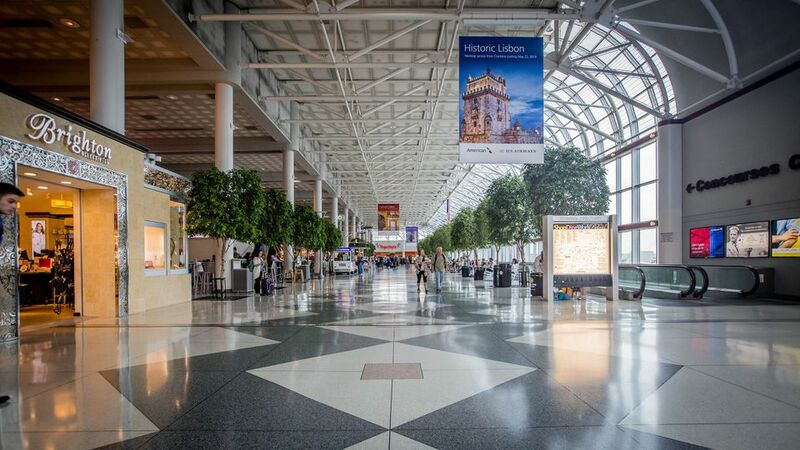 Hissho Sushi, Great American Bagel, Ciao Gourmet Market, The Local Rustic Market, Pinkberry frozen yogurt, and Starbucks are all in concourse D.
Shopping is a bit limited with Shades of Time (sunglasses), duty-free, CNBC Express, and Carolinas NewsBeat. Also an American Airlines terminal, this concourse offers 10 locations to whet the appetite, including Starbucks, Burger King, Salsarita's, and Farmers Market. You will also find Einstein Bros. Bagels, PZA (for a slice), Pronto! Mercato (Italian sandwiches), and Brioche Dorée (French bakery-inspired pastries, sandwiches, salads, soups, and quiche). Dale Earnhardt Jr.'s Whisky River, winner of the best airport bar in America for 2016, serves up beer and wings, along with other pub-style food. If you are just looking for a drink, stroll on over to the Explorer Lounge. Shopping here is pretty focused with CNBC Express and News, Carolinas NewsBeat, and New South Travelmart.